Most of us have heard the story of the tortoise and the hare. Although it is not a true story, it is meant to teach us a valuable lesson that the race does not always go to the one that is fastest. 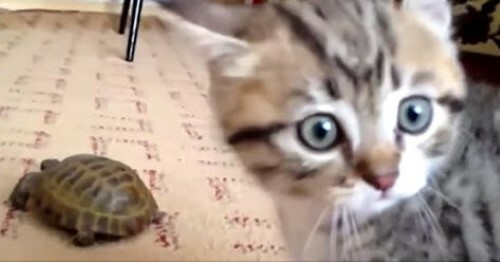 In this video, you are not dealing with those two animals but you are dealing with a tortoise and a kitten. This is a true life story, and it ends in a battle of epic proportions. The tortoise is slowly crawling across the floor, heading toward some unknown target. Suddenly, the kitten bursts into action in a flurry of fur, teeth and nails. Although the kitten is trying his best to get on top of the matter, it seems as if the tortoise is just giving him no attention at all. In the end, I would say that the tortoise got the better of the kitten. What do you think? You will be happy to know that no animals were harmed in the making of this video. It is just an adorable kitten doing what they do best, having fun with whatever happens to come their direction.